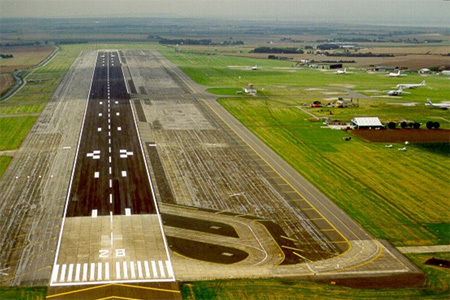 Thanet District Council has voted no to pursuing the compulsory purchase of the former Manston Airport with American fund Riveroak. The latter would not be a “comfortable” indemnity partner, the leader of TDC, UKIP’s Chris Wells told councillors this evening. He said Riveroak’s proposals failed to meet the public interest criteria for a CPO. Further, they had promised a “letter of credit” from a credible financial institution (named tonight for the first time as Deutsche Bank). This, he said scathingly: “Became a ‘letter of assurance’, then a ‘letter of commitment’, then a ‘letter of comfort’ and finally an ‘expression of interest’”. The latter, he suggested, when it eventually appeared was so riddled with caveats it wasn’t worth the paper it was written on. Another letter from the American fund purporting to show their financial backing – but offering nothing binding – had the investors’ names blacked out. He offered to lead a “coalition of the willing” to pursue the CPO with Riveroak. Conservative councillor Ken Gregory urged TDC to “take risks”. Chris Wells responded that TDC had racked up a legal bill of millions for a botched legal attempt to halt live animal exports, for failing to pay its share of the East Kent spine road, for its tacit support of a failed ferry enterprise and for the debacle of Ramsgate’s Pleasurama development. The legal bill if a Manston CPO went wrong would be “two to three times” bigger than all these colossal instances of mismanagement combined, he claimed. But before the assembled councillors voted against the CPO with Riveroak, he said four other potential indemnity partners had come forward – he declined to name them until all negotiations with Riveroak were complete. The latter has threatened a judicial review of the decision, he suggested. Riveroak’s lawyers had earlier sent round a paper to councillors rebutting the findings of TDC’s report. Many councillors were furious for having been “left in the dark” by what they claimed was a secretive and arrogant leadership. Councillor Wells’ supercilious manner may not have helped. But the facts were on the table and to my eyes they didn’t make Riveroak look good – even if a pro-CPO audience in the overflow room (who kept up a running commentary on the council leadership’s sexual proclivities, personal finances, sartorial choices and preferred colour of envelope) didn’t agree. The protestors drifted home after the meeting, as did the lawyers. But the Manston CPO saga looks set to run on for longer yet. God knows what this imbroglio will eventually cost. And meanwhile, other opportunities are being missed.